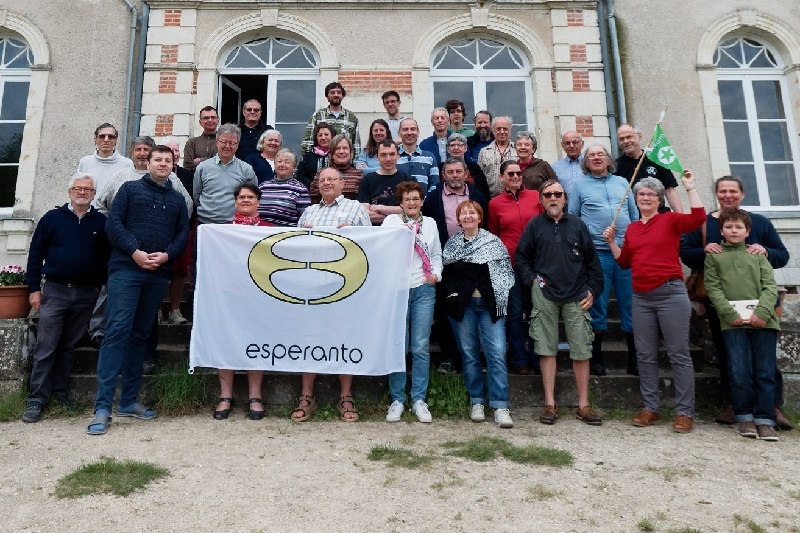 The Cultural Center of Gresillon, in COLLABORATION with ILEI (International League of Esperanto Teachers) organizes courses for people who have begun to learn Esperanto and who wish to make rapid progress thanks to intensive courses led by experienced teachers who use Esperanto through active methods. We offer three levels (courses). 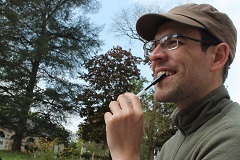 Teacher: Przemek WIERZBOWSKI, pole, studied law in Bialystok university (Poland), worked in 2008 as an EVS volonteer in Esperanto-Kultur-Centro in Toulouse (France), and worked for the city of Bialystok to help organize the 94th World Esperanto Congress. He attained the C1 level certificate in Esperanto proficiency, and attended training in Poznan (Poland) for Esperanto teachers. 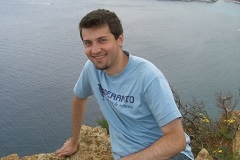 In 2012-2013, he worked in the "Intercultural Esperanto Center" in Sicilia, and taught in schools. Nowadays, he spends a large part of his time working for the Bialystok Esperanto Society. Przemek teaches Esperanto in Bialystok and at international events such as SES in Slovakia. Goal: Acquire Level B2 (strong intermediate level of language use). At this level, the students must already have Level B1. All those who wish to improve their language use are welcome, but especially those who already or will soon teach Esperanto. The course will also prepare for the exams at the end. Przemek adapts the course to the actual level of the participants, all the while providing material at a higher level for those who wish to pass the C1 exam. Presentation: The course will concentrate on increasing vocabulary and every-day expressions, and their use in conversation and naration. The course will look at all the important grammar, and will prepare the students for the exam with exercises, written tasks, games, conversations, and roll-playing. Teacher : Christophe CHAZAREIN is an activist at Esperanto Cultural Center of Toulouse. He has been teaching Esperanto since 2006. In 2009, he spent one year in Białystok as a European volunteer, and received training in Esperanto at the University of Poznań. Since 2011, teaching - Esperanto and Occitan - is his main activity. In 2014, he created Ins’eo, an association whose aim is to promote more modern teaching practices, and to encourage the professionalization of the teaching of Esperanto. Objective: Acquire level B1 according to this definition. Those who register at this level must have at least an A2 level. This course is for people who wish to acquire a sufficient level to communicate in most situations where Esperanto can serve (travel, international meetings, correspondence, etc ...). Manual: There is no manual required. The use of a monolingual dictionary (such as WF Pilger’s Baza Esperanto Radikaro, or the Plena Ilustrita Vortaro) is recommended, especially for those who want to take the ILEI-UEA exam. Presentation of the course: Learning a language is much more than assimilating rules of grammar and vocabulary. It means developing your ability to communicate - that is, to listen, read, write ... and above all speak! If you have bases in Esperanto, but you feel too limited and if you want to give yourself the means to use it in most situations during travel, Esperanto congresses or on the Internet, then this course is for you. This course also aims at preparing for the oral and written tests of the ILEI-UEA level B1 and B2 exams. Teacher : Marion QUENUT has taught Occitan in Toulouse since 2011. Passionate about languages (she knows eight), she has created and administers since 2006 the site toulangues.org, the Toulous portal of the languages of the world. She began her apprenticeship in Esperanto in 2006 in a course with the Esperanto Cultural Center in Toulouse. Since then she has regularly organized courses for this association. She received a certificate of level C1 in Esperanto. Objective: Acquire level A2 according to this definition. This course is for beginners and people who have already started learning Esperanto but still see themselves as beginners. Manual: There is no recommended manual, the course will be based on new media (intended for a new manual in project). André Andrieu’s dictionaire pratique (16 €, published by SAT-Amikaro) is recommended. Presentation of the course: This course will focus on oral communication from the beginning, but all the skills of the exam are worked during the week with the help of games and similar activities. Levels: The UEA Examinations Commission has agreed to the organisation of Esperanto exams of levels B1, B2 and C1. You can take the full test (written + oral) or only one part. It is possible to change the level on site. The minimum age is 14 years. The written and oral parts must be held at the same level. Registration: For CEFR registration and prices, see below. Diploma: After successful completion of the examination, the state-recognised Hungarian Examination Centre Origó in Budapest will issue your diploma in 4 languages. This diploma is recognised in Europe and other countries outside Europe. About CEFR: See the rules of examination. See wikipedia. org about the CEFR framework. See the specimens of examination (in Esperanto). See about a new French law - a chance for Esperanto! :-) Listen JoMo singing CEFR. 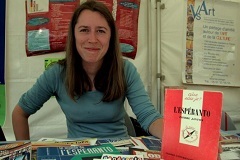 Listen an interview with Katalin Kovats (in Esperanto). Travoji arbaron aŭskulte al la naturo, surprizi kapreolon surpade, trairi valetojn, laŭiri riverojn, admiri panoramojn al la kamparo anĵua kaj burgonja, alsupri montetojn ... tiom da okupiĝoj por partopreni kune! Ni migrados laŭ la verda vojo kaj laŭ iuj el 31 eblaj migradpadoj ĉirkaŭ Baugé, tra kampoj kaj arbaroj, laŭ riveroj kaj lagetoj. Ni ekiros foje rekte de la kastelo, foje veturos per niaj aŭtoj al la start-loko. Ni marŝos meze 15 km ĉiutage. Vi alvenos en Greziljono inter vendredo 26/4 vespere kaj dimanĉo 28/4 vespere, plej malfrue lundon 29/4 antaŭtagmezo. Lunde ni faros du duontagajn promenojn. De mardo ĝis vendredo ni migros dum la tuta tago, tagmeze ni piknikos. Ĉiuj hejmeniros sabaton 4/5 matene. Planita horaro: 8h matenmanĝo, 9h foriro, 17h-18h reveno, 19h vespermanĝo, 20h30 vespera programo. La grupo ideale konsistu inter 6 kaj 12 homoj. Olivier akceptas gvidi eĉ malgrandan grupon. Lia celo estas praktiki la lingvon. Tial li atendas nur esperantistojn, eĉ se temas pri komencantoj. Lingva bano tre efikas por lingvolernantoj, ĉar kutime oni senĉese babiladas dum la tuta migrado kaj ĉar tiuj konversacioj estas pli vivaj ol en klasĉambro. Laŭ via peto, Olivier povas konsili kaj korekti vin por pli efikaj progresoj. Olivier BUISSON estas kampogardisto (kampara policisto) laŭprofesie, li pasie ŝatas migradon kaj Esperanton. En 2010 dum 10-monata vojaĝo en Sudameriko, al li trudiĝis la ideo fondi asocion pri migrado por esperantistoj kaj Esperanto-ŝatantoj por reklami migradon en la esperantistaro kaj Esperanton ĉe la migremuloj. Jen lia retejo. The price of your stay is automatically calculated during your online sign up. For a price estimate, just fill in the age category, the bed room and the number of nights. Price from 4 € per day (courses and activities, camping, own meals). Reduced price for meals, courses and activities child, teenager or person with modest resources. All-inclusive rate (excluding exam) for a 7 day stay for an adult, including full board, lessons and activities: between 279 and 472 € (camping 246 €). 5% reduction available on the all-inclusive rate for signing up and paying a non-refundable deposit of €100 at least 2 months before the start of the event. Click here to sign up. Consult all our tarrifs here. For other prices please contact us. Inscription: Contact Christophe (by E-mail at <ch.chazarein@gmail.com> or by phone +33-6.31.80.40.07), who will help find your level and fill in the inscription form. Show map with the home towns of the participants. Contact us about car sharing, or consult this page.